Please note that the content of this book primarily consists of articles available from Wikipedia or other free sources online. 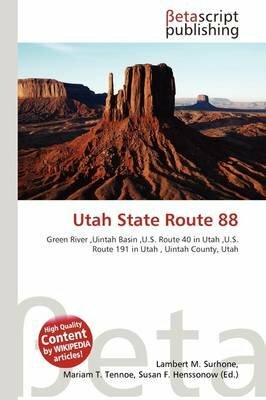 State Route 88 (SR-88) is a state highway in the U.S. state of Utah, connecting Ouray to US-40/US-191.SR-88 begins at the south end of the Green River bridge near Ouray, within the Uintah Basin. It heads northwards, gradually climbing through the valley of that river, passing east of Pelican Lake, and onto a more rugged plateau just beyond the intersection with 4500 South (which carried SR-88 until 1969). The route's north end is at US-40/US-191 on this plateau.